And by the way, these cute little gluten free cupcake bites are not my own invention. The idea for them comes from Bakerella’s book, Cake Pops . You may want to check it out, it’s a gorgeous, fun and original cookbook. Speaking of which, if you haven’t already, check out my recent recipe for gluten free Chocolate Raspberry Cake Pops. My husband and children thoroughly enjoyed these decadent little gluten free treats. 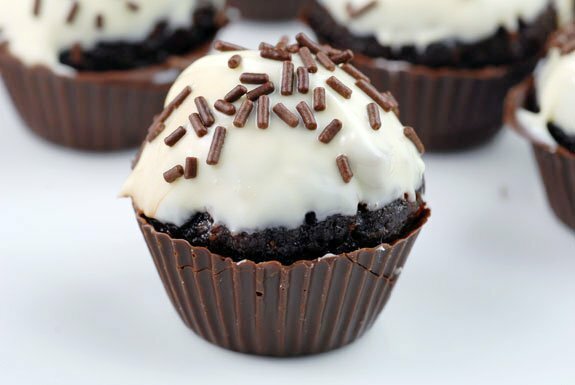 Though my husband said that instead of calling them gluten free Cupcakes Bites I could call them “Cake in a Cup.” He could not believe that the “wrapper” of the cupcake was made of chocolate and edible, telling me he thought it was a paper wrapper until he bit into it. Thank you for including the PDF to your chocolate cake recipe. You are so generous! Can’t wait to make these. Thanks for including the PDF to your cake recipe! I have the cookbook (and the cupcake one) but I forgot to bring them on vacation and I am making a cake for my son’s birthday tomorrow. I am saved. Thanks for being so generous with your recipes! These are so ridiculously delicious!!! Thanks for sharing :) A little time consuming, but on-so-worth-it! My brother has Celiac and finding you’re blog (Thank you PW!) has been a blessing. Can’t wait to keep reading. These cupcakes are genius.